After finally tackling how to crochet rocks from a pattern, I got it in my brain that I wanted to create my own crochet motif for a rock. That way, I figured I could easily do an original tutorial for you all. 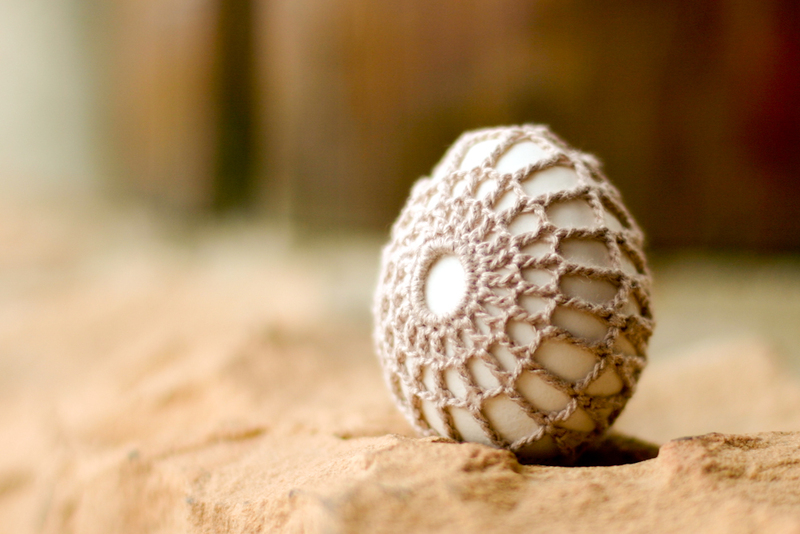 Then, it occurred to me, like a lightbulb, that crocheting rocks is an awful lot like crocheting on top of an egg–how fun! and just in time for easter. So, I set to work creating two different patterns for eggs. Below, I’ve photograhed a detailed step-by-step tutorial for one of them and provided a written pattern for the other. 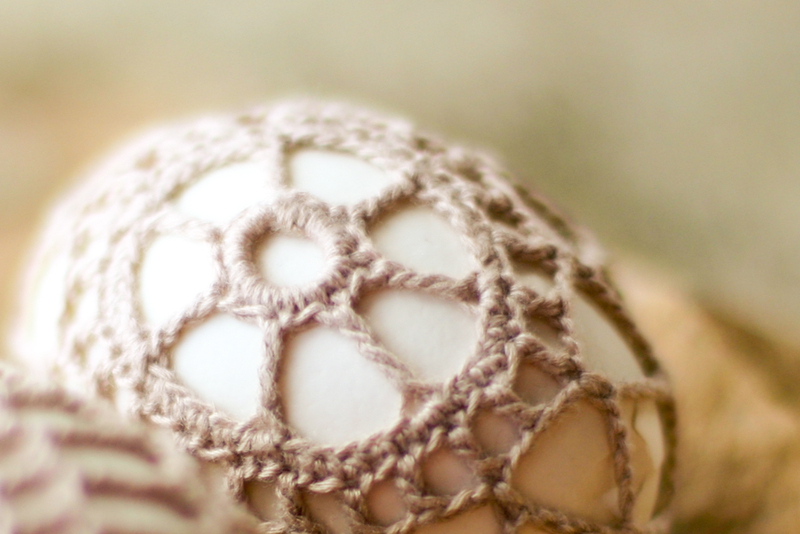 Crocheting the egg was quite similar to crocheting on a stone and all of it quite easier than I ever thought it would be. So if you’ve ever considered trying it, give it a whirl. 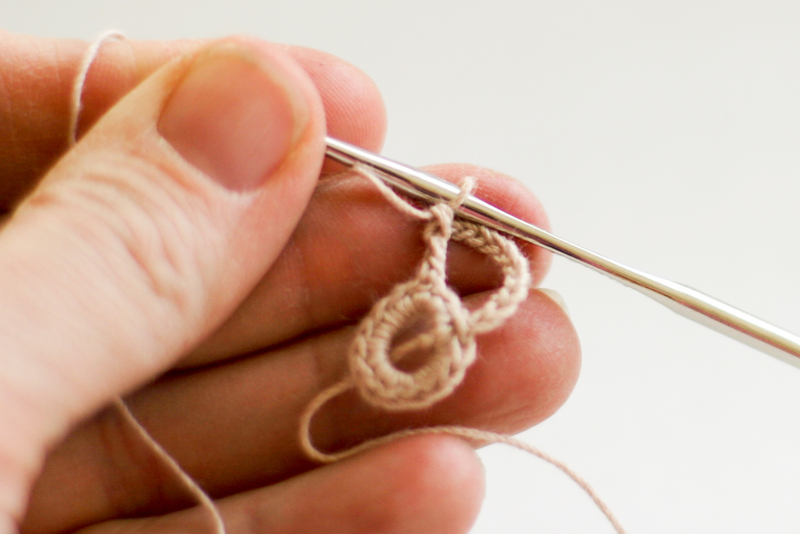 It truly is as simple as slip stitches, double and triple crochets. I think they provide a beautiful, natural look for Easter, though you could certainly do them in other colors as well. I have not quite figured out how to read or create a crochet chart at this point, so I apologize to those for whom chart patterns is the way they work. 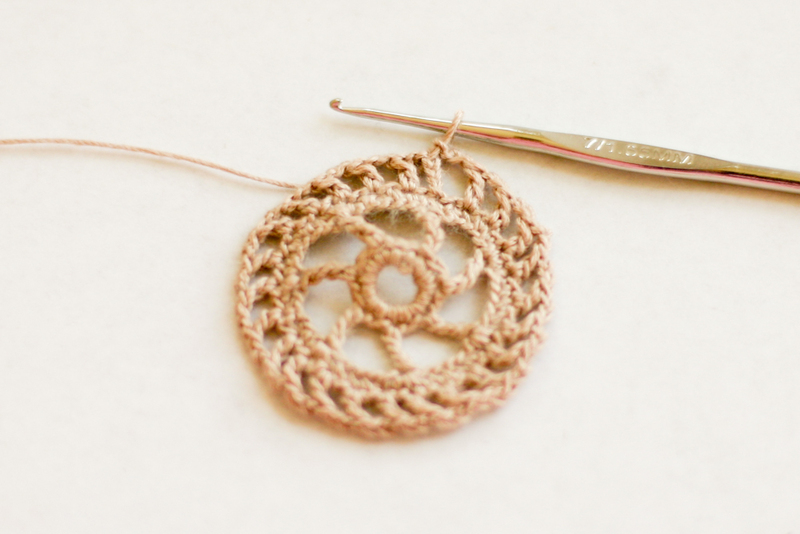 And, being a newbie to crochet pattern writing, if any of you experts out there see a way to improve my patterns, please do let me know. I had a ball making these. I love gaining skill in a new craft. Hope you all give them a try! Here is the pattern for The Helm’s Egg. 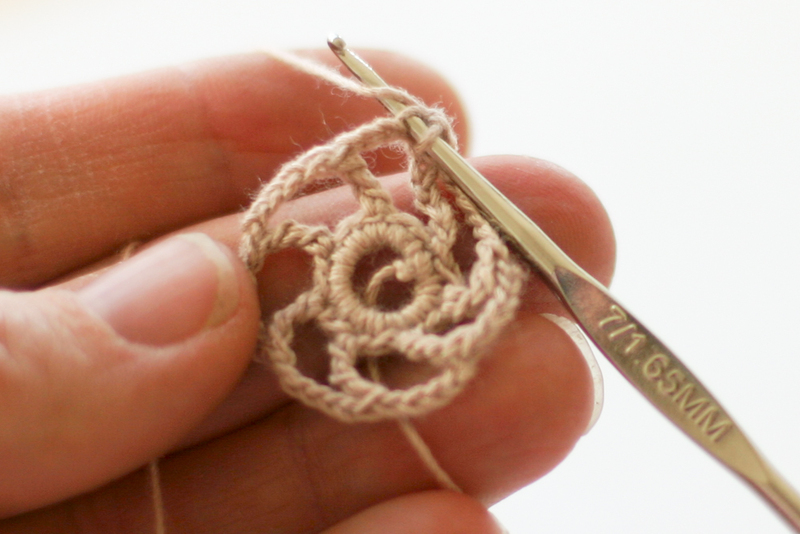 Please note that there are multiple photos per each round of crochet to show you as much as possible. Round 6: *Ch 14, skip one st and sc in next st, repeat from * to end, sl st into beginning of round. 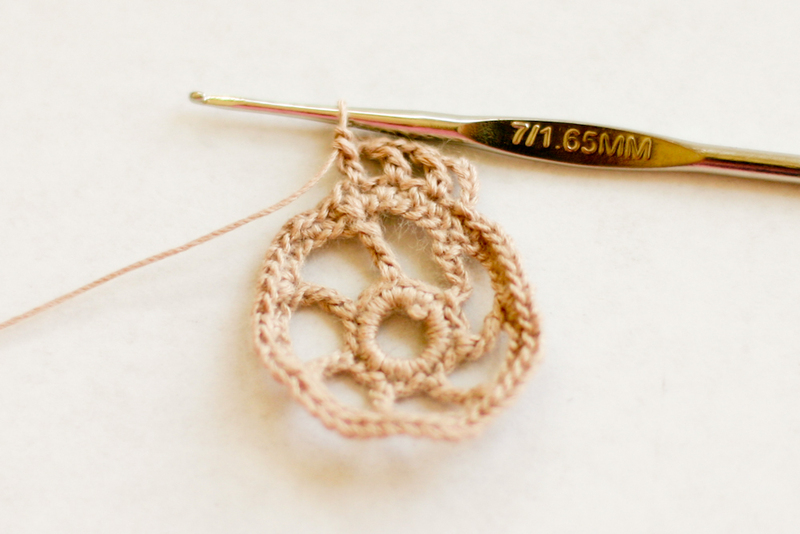 If you are crocheting on the bigger side, or your egg is smaller, here is the place to adjust the pattern. To make the cover smaller ch 10 instead of 14. Round 7: Ch 6 , sc in next space, *ch 10, sc in next space, repeat from * to end. To adjust your size, you can make these chains shorter as well. Round 8: Ch 4, *sc in next space, ch 3, repeat from * to end of round. 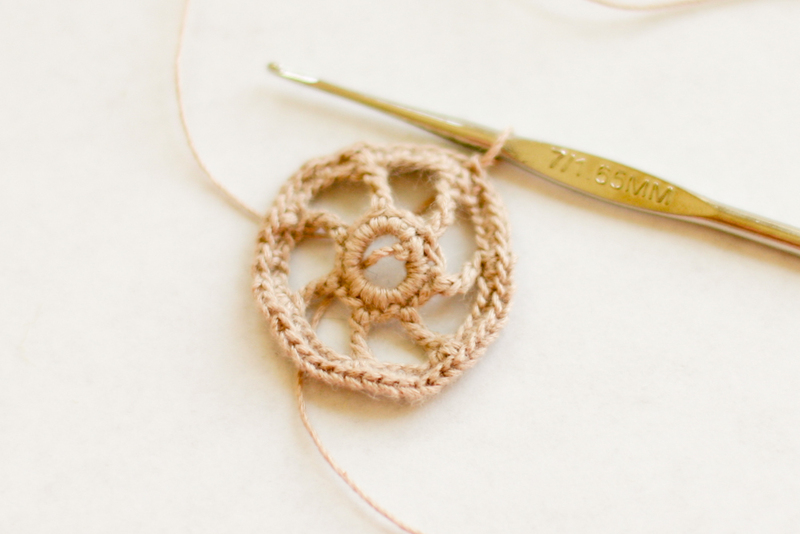 This will start to make a little pocket with your crocheted piece. Before this round is finished, try it on your egg to make sure it will fit. If need be, adjust the prior round to help it fit. 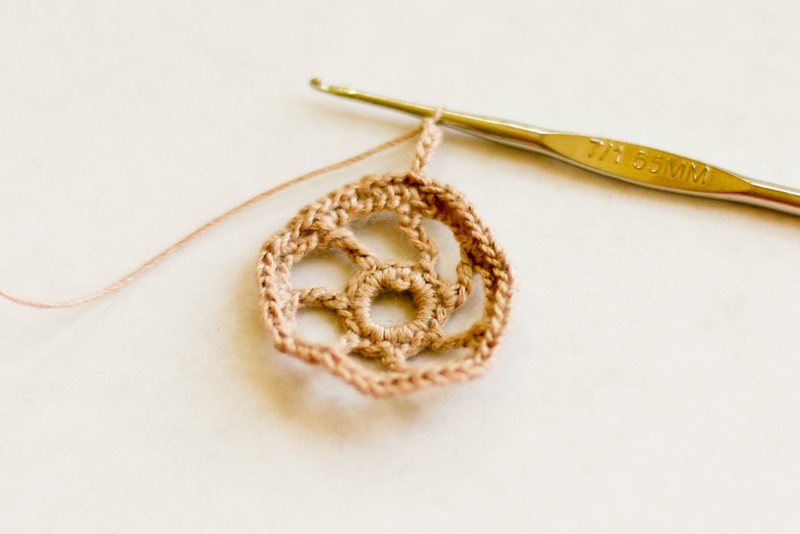 About half way through, you should continue crocheting on the egg itself. 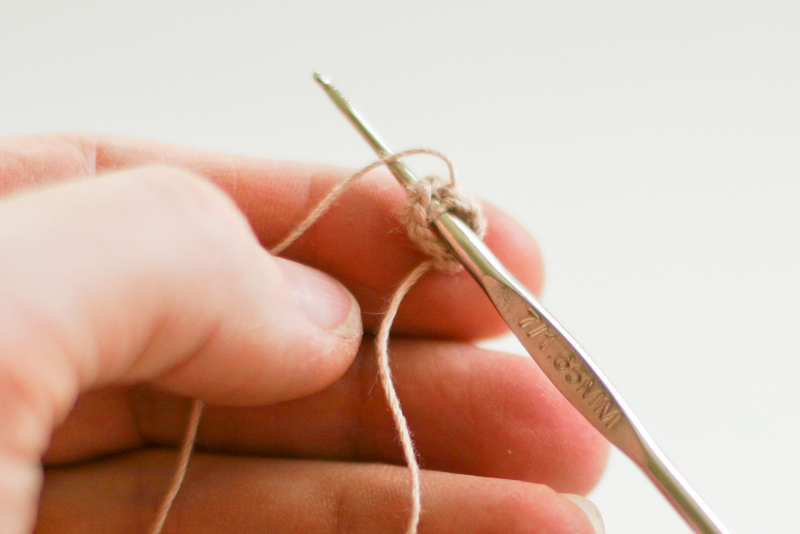 Some of your stitches will be pulled more apart than others depending on how tight the fit is. Pull the end through the last loop. Weave in the loose ends. 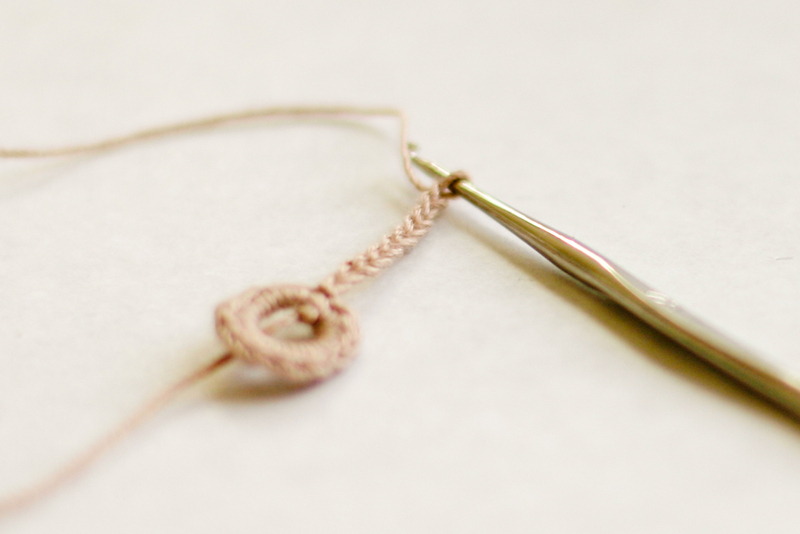 Round 1: Make a chain 16 sts long. Join the chain with a sl st to form a circle. Round 2: Chain 1 sc through the center of the circle 20 times. Join with sl st. Round 3: Ch 4, *dc in next st, ch1, repeat from * to end of round, sl st through 3rd chain of first ch 4 made. Round 4: Ch 5, *dc in next st, ch 2 , repeat from * to end of round, sl st through 3rd chain of first ch 6 made. Round 5: Ch 8, tc in next st, ch 3, repeat from * to end of round, sl st through 4th chain of first ch 9 made. 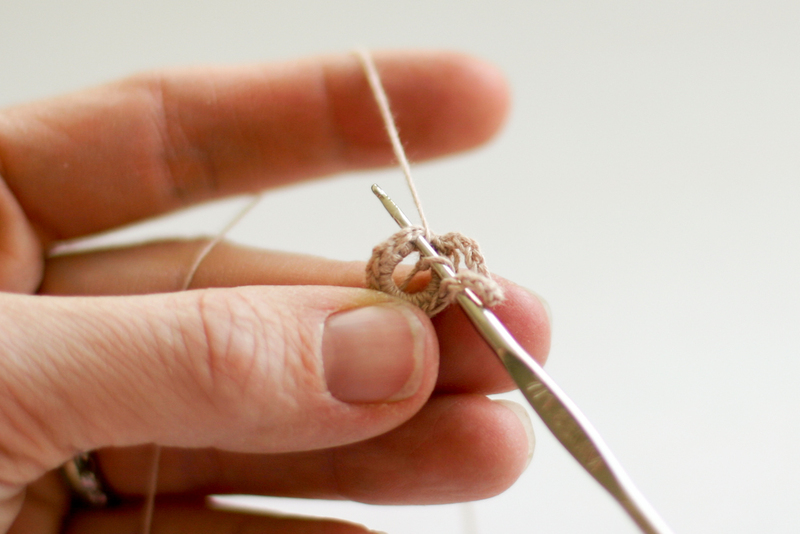 Round 6: ch 10, sc in next stitch, repeat to end of round, sl st to complete round. 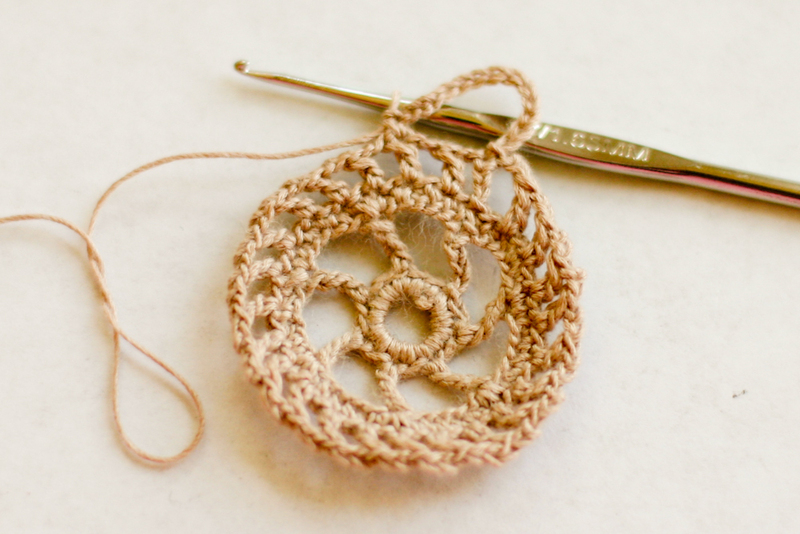 Round 7: ch 4, *sc in next space, ch 1, repeat from * to end of round, placing the crochet piece over the egg to finish as you get to the end. If you need to adjust this to fit the egg, try making Round 6 chain shorter or longer, or increasing/decreasing the chains in between the sc in Round 7. Here’s wishing you a very merry Easter holiday with you and yours. Hopefully, you find time to make one of these beauties somewhere along the way! 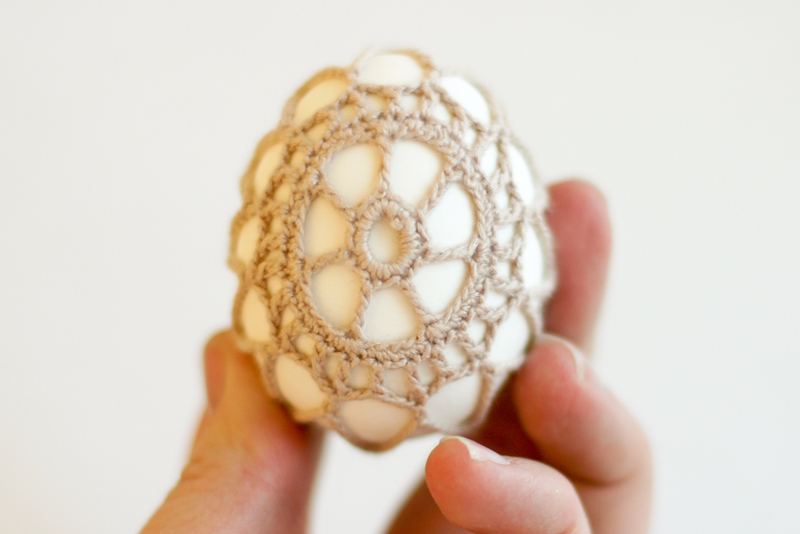 Okay, first the stones, now eggs, I have to learn how to crochet! 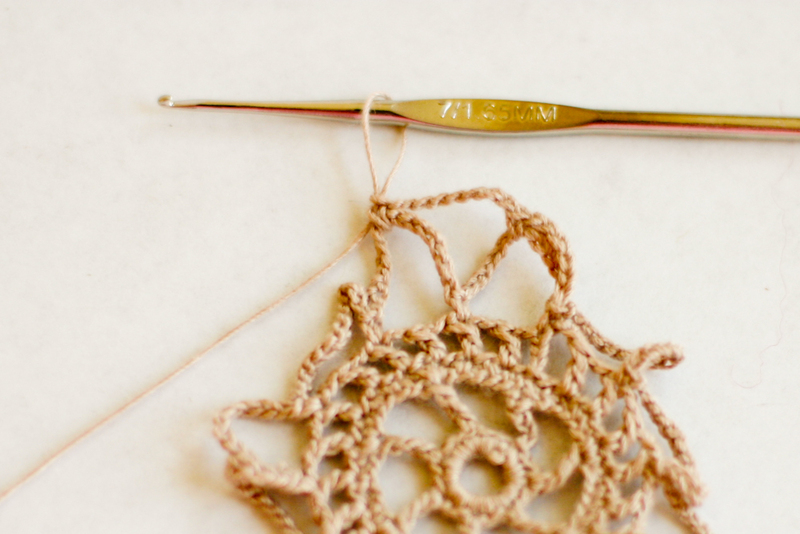 My grandmother crocheted—and taught me when I was a little girl. 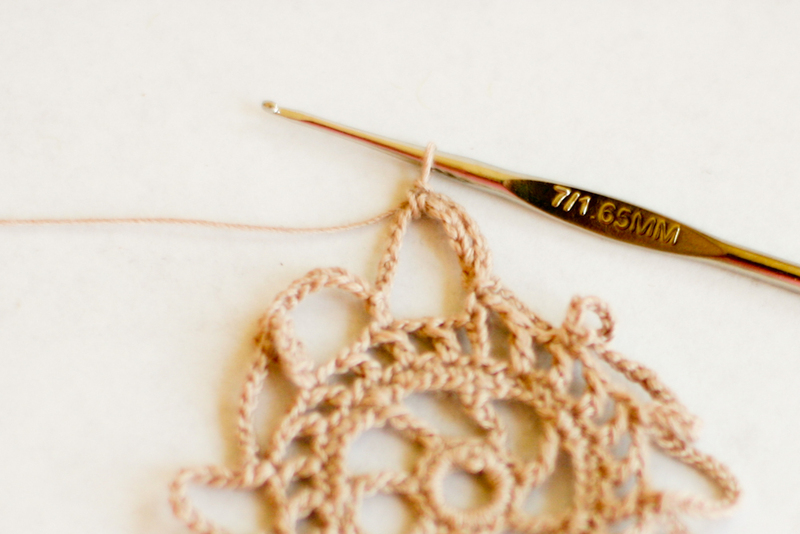 Any time I see the delicate, doily-like stitches like hers, they make me smile. These did. 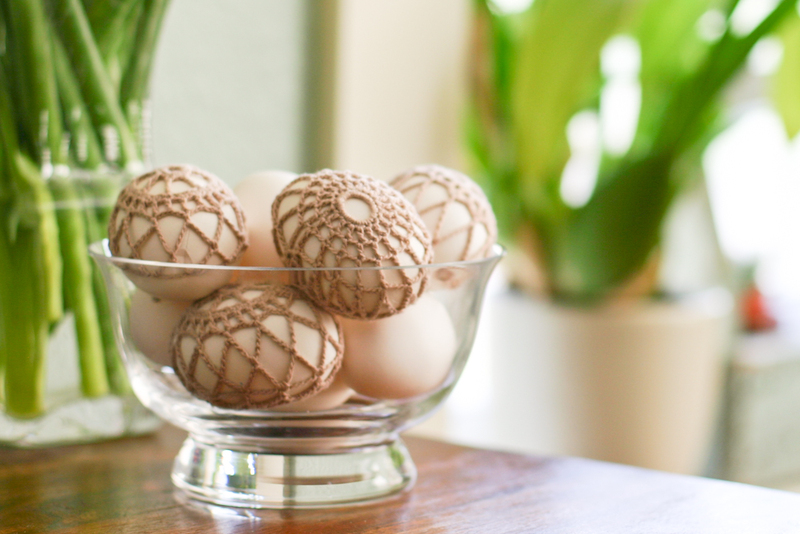 Love your crocheted eggs. I’m so glad! You should try them :). 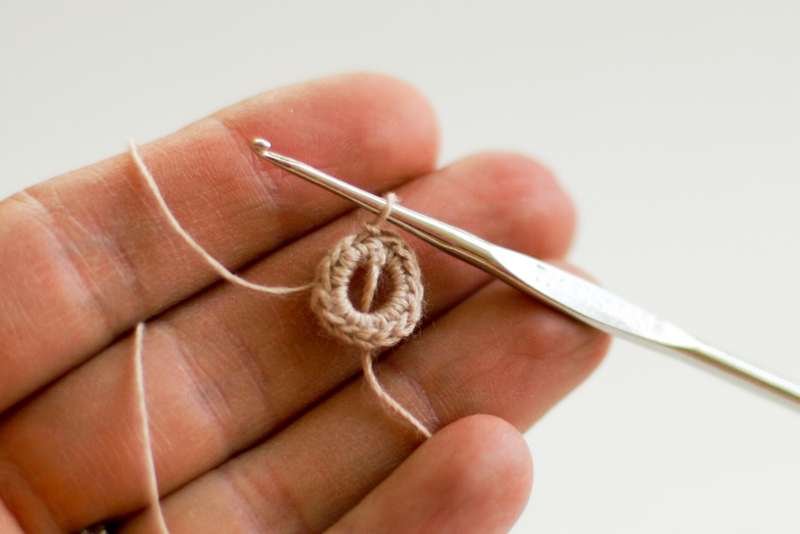 I’ve never crocheted so teeny tiny before. I loved it. These are just so beautiful, truly. How can something so simple be so pretty? You did a wonderful job. I want to try it on stones, too. Wow. Lynne, Thanks so much. 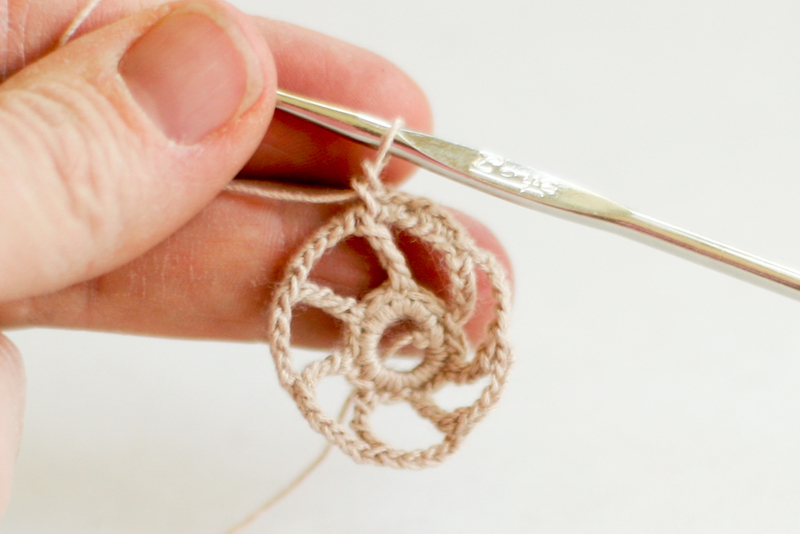 Definitely give it a whirl, so much fun to make. And, somehow, so satisfying! 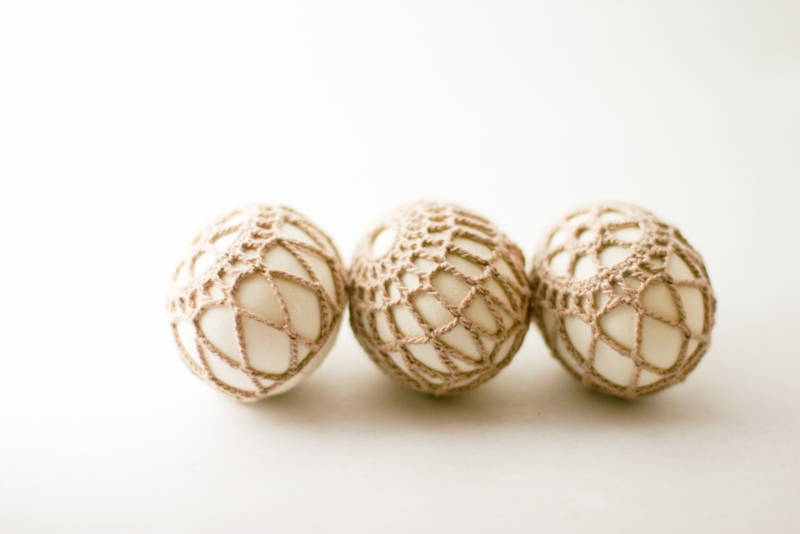 such a perfect way to take the crocheted stones and make them seasonal! lovely and wonderfully creative! So beautiful! I think I love the eggs more than the stones! 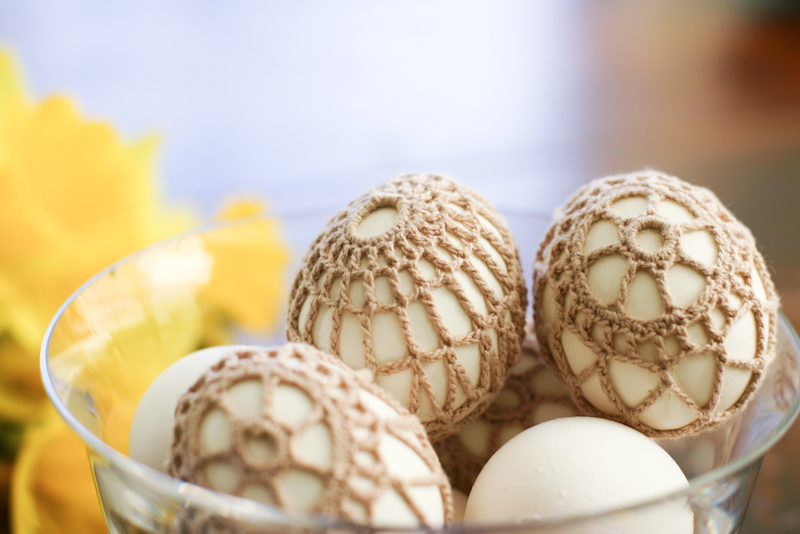 These crochet Easter eggs are stunning! Just popped over from maya*made, these eggs are gorgeous! Well done! 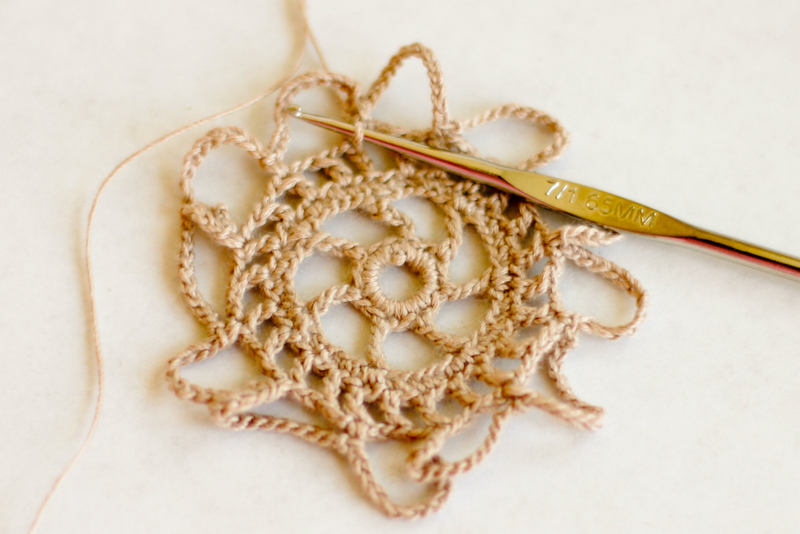 I still have learning how to crochet on my list of things to do and this project has me very inspired! Thanks for sharing your tutorial, I’ll be back! Actually you can. I used a wool thread and they stretch a bit. I think I’ll be able to take them off and re-use them next year. With each time on and off an egg, they get more stretched out, but I think they’ll last a few seasons :). Hope you make some! 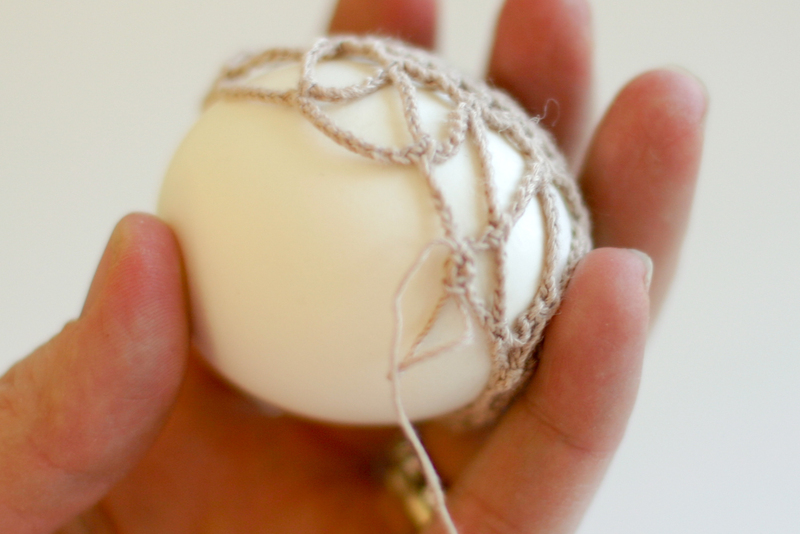 I think I’ll try this but with # 10 thread and instead of an egg I’ll insert a balloon and blow it up and starch it. Then decorate it. These are beautiful, you clever lady! Thanks for sharing the idea and the pattern. 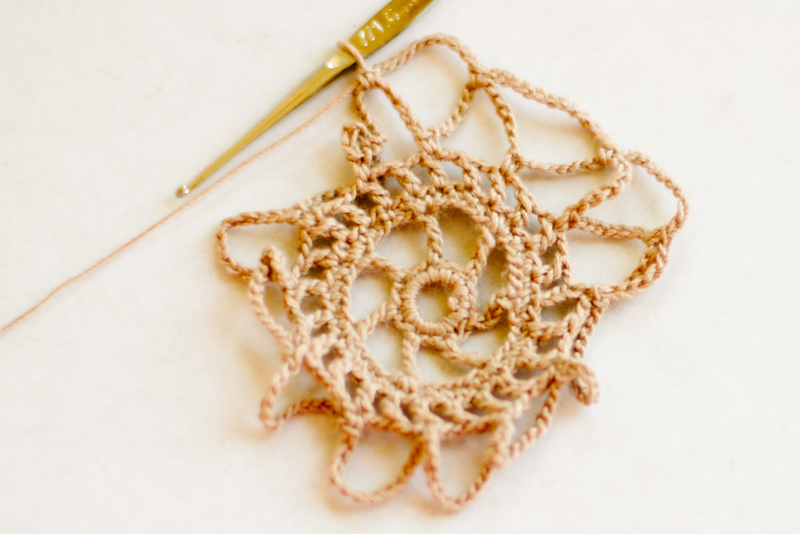 These are absolutely stunning…..don’t think I can crochet fast enough to whip some up before our Easter dinner, unfortunately. Very beautiful! Another project on my to do list. oh, holysmokes… I just stumbled upon this blog somehow and I’ve been clicking ‘older post’ for a little while. It’s been fun, but this post is the icing on the cake! I can’t wait to make these. Lots of these. Lots and lots of these. Thanks so much! So glad you are enjoying the blog! Your welcome. Definitely develop your own pattern and then come back and tell us where to find it! 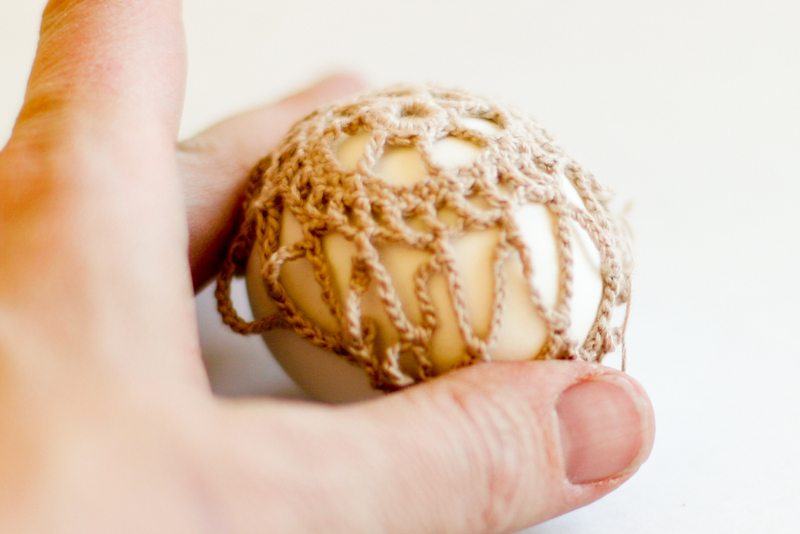 Yes, you could cover the egg entirely, you would just continue decreasing the number of stitches making the rounds progressively smaller. Test it over the egg as you go. Happy Easter! Wow! These are absolutely incredible!! We had to feature this in our egg post (with a link to your site, of course!) – we are so impressed. Thank you for the beautiful inspiration. Keep it coming! These are so delicate and beautiful! How do you feel about someone using this pattern and selling their creations? Or altering it, but using it as a base to get their own started? Thank you!! Thank you for being sensitive enough to ask. This pattern was not intended for sale or production, but for personal use. 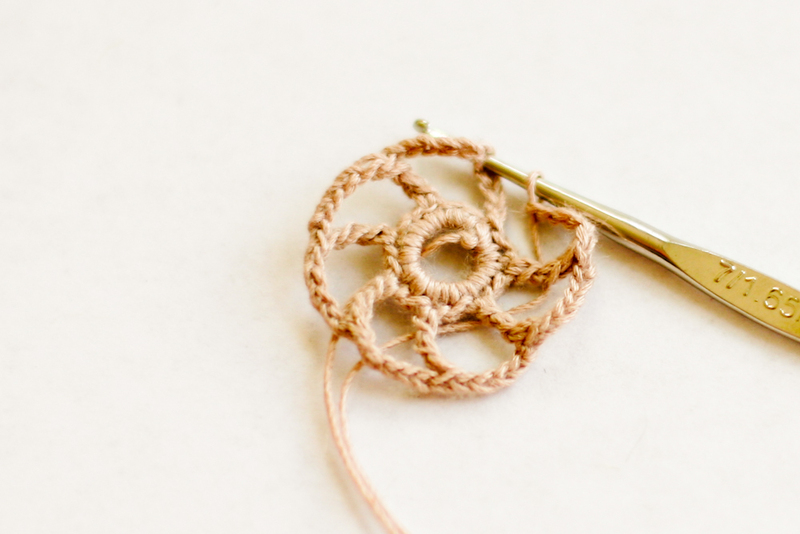 I’m sure after making a few, you will be able to create your own pattern for whatever creation you intend. I wish you all the best. splendid! + can’t wait to make bunches. thanks so much for sharing ur ideas & patterns. u make it so simple. Thanks so much Pat! Enjoy!! Just Timeless Beauty !!! 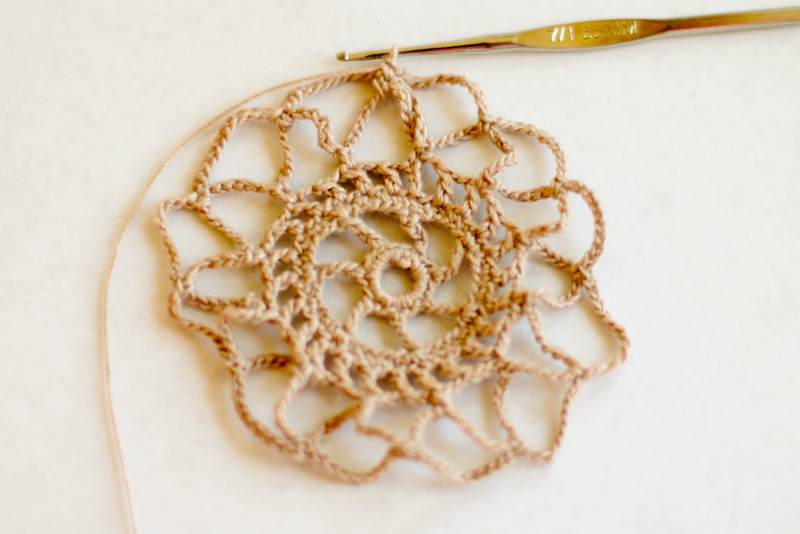 The Possibilities are Endless…What about crochet wraps for handmade soaps in a Guest Basket, or for Mother’s Day !!! I Want to Learn too…Must find Me a Class Some Where !!! Thanks for Sharing…SO BEAUTIFUL !!! Thanks so much Darlene! I love your enthusiasm! Yay! I was thinking they would be great on plastic eggs for center piece. Great idea Sue! That would be wonderful! Round 6 is not very clear to me. After making the first 10 ch, do I just do sc all around OR do you mean (10 ch, sc in next ch) all around? Grateful for your clarification and than k you in advance. Hi May, I understand why. I should have put brackets around the repeat part. You should [10 ch, sc] all the way around. I hope you figured it out and I’m not too late! 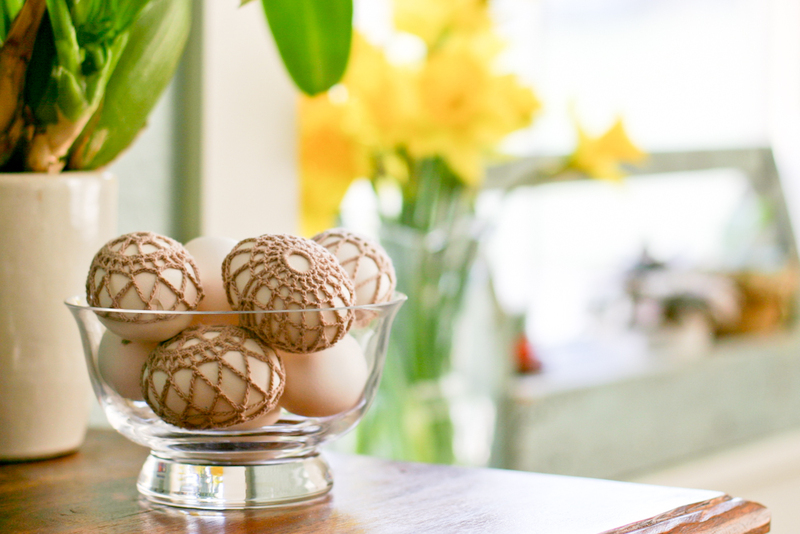 This is a very beautiful way to show off our eggs for Easter. Thank you so much for this beautiful tutorial. Thanks so much, Roxie! Happy Easter to you! Thank you for your lovely comment. 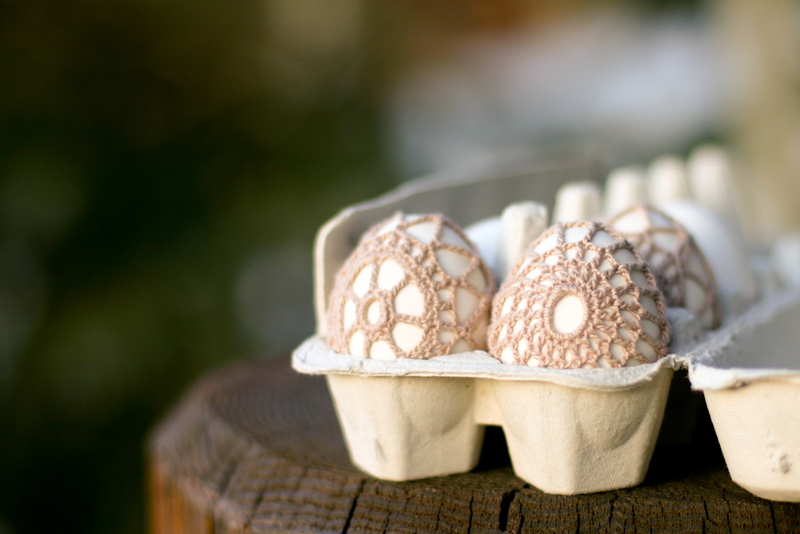 Crochet over eggs is truly beautiful. Love these! 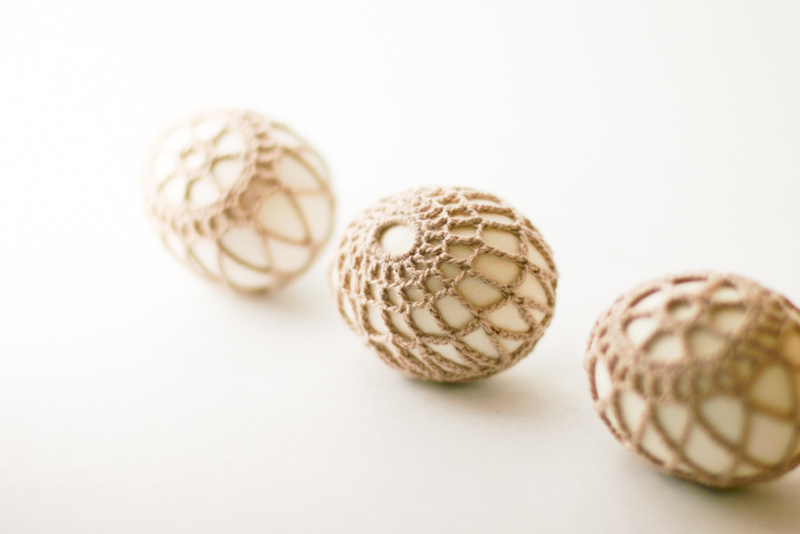 I’m going to adapt them to round balls (ornaments) for Christmas!! Thank you, thank you! Just lovely, can’t wait to cover my eggs!! fYI. Walmart is selling faux white eggs at 1.98 for twelve. Look so real i fooled my friends. I will be able to store this beautiful patten forever! The eggs come with dye packets and a cute paper tray! Happy Easter and thanks for sharing this lovely patern, p.s. Your pictures rock!! Oh wonderful, Carol! Thanks so much for your comment! I’m glad you like the pattern too! I’m really sorry to be negative, but I’ve got a sort of net that goes over my egg and there’s nothing to keep it on. 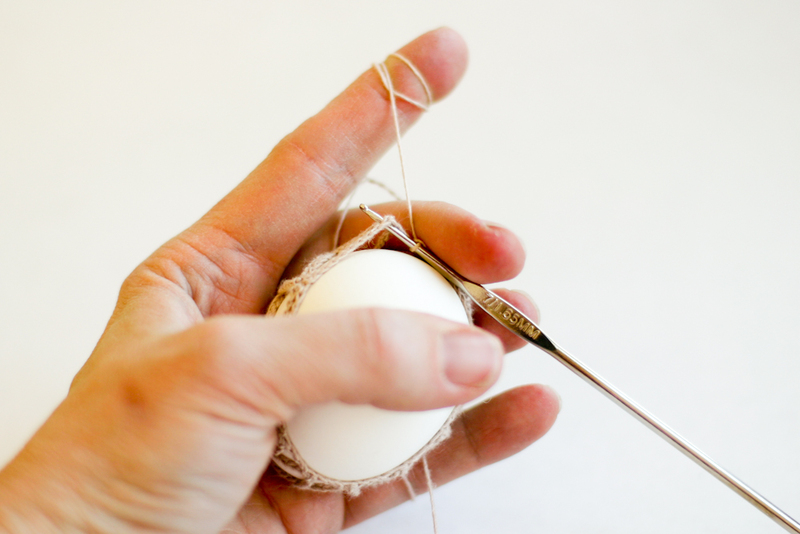 What did you mean by crocheting on the egg? How much of the egg is supposed to be covered and where does the point of the egg go? At the beginning of the work? At the end? I’m baffled! I’m so sorry you feel frustrated!! The center circle goes at the center of the egg. 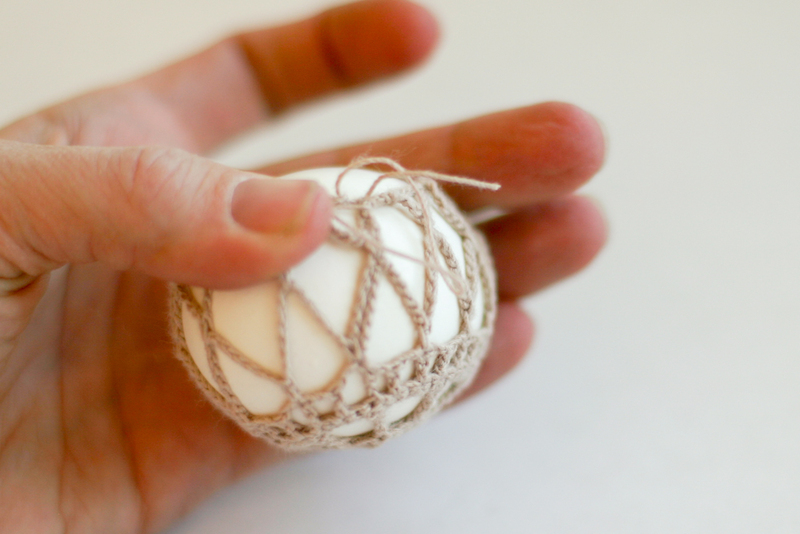 Wrap your net around the egg and do the smallest tightest circle while you’re on the egg to hold it snugly against the egg. So the start will be in the fattest part of the egg, and the end will be in approximately the same spot on the other side of the egg. 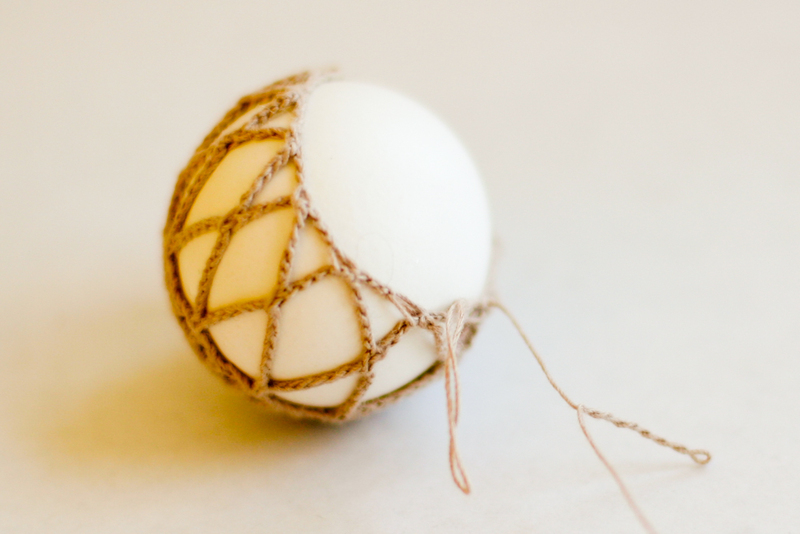 The point of the egg and the bottom of the egg will be captured in the sides of the net. 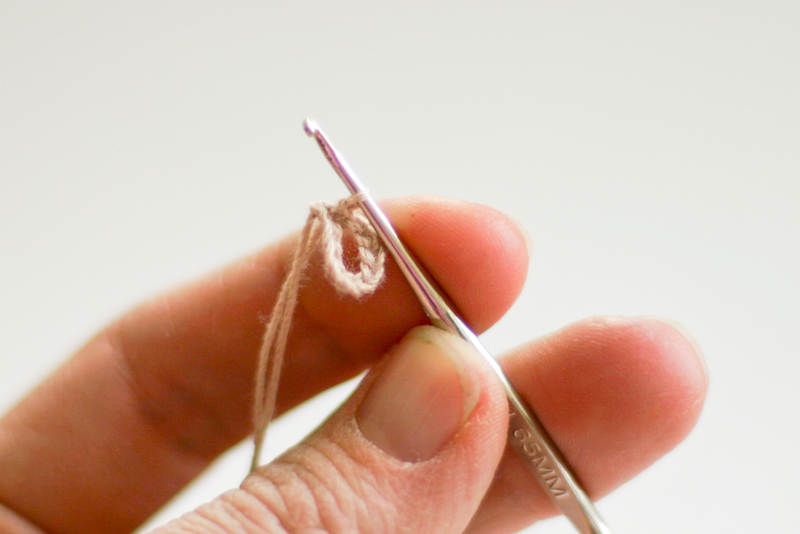 If the net is still loose, you may be using thread that is bigger, and you need to end your net a round earlier. Hope this helps!